1 When the Holy Child had grown to the full stature of maidenhood, the Mother of All Things took Her to a high place upon the earth, saying: To You I give the governance of all earthly things. 2 You shall command the movements of the waters, and the wind shall be Your servant. 3 The seasons of the earth shall You control, and all the times and seasons in the lives of My creatures. 4 Every soul on earth and in the heavens shall be given into Your care, and the highest stars of the firmament shall know You as their Sovereign. 5 For all these things must be put from Me; for they can no longer look upon My brightness. 6 And the Maid ruled over all the world, making the earth grow fruitful and attending to the prayers of Her creatures, and oftentimes making prayers of Her own that they might come closer to the Mother. 7 And Divine Light shone once more upon the earth, and the Maid was a friend to every creature, and all who turned to Her were filled with life, and with the peace that comes of wholeness. 8 For the waxing and the waning of twelve moons reigned the Maid. 9 And after the twelfth moon had appeared in the sky, the Mother of All Things called Her Daughter to Her, and spoke to Her, saying: You have made the whole earth fruitful and brought My light to all the world, have You not satisfaction in Your work? 10 And the Maid replied, saying: I have brought Your light to many places, and yet a place there is which remains ever in darkness; a place beneath all places, in which there is no light. 11 And the ways of entrance to that place are many, for there is a place at the bottom of each earthly soul into which Your light cannot shine. 12 And Her Mother asked of Her: Do You know what thing it is that You must do if You will bring My light into every place? 13 And the Maid replied: I know what it is that I must do. 14 For She knew that She must descend into the nether regions, giving up the Divine light and going down into that place wherein is no light, but only the profoundest darkness. 15 And this was Her taking on of fate upon Herself. 16 And the Mother of All things removed the Divine light from Her Daughter, and blessing Her, sent Her forth, saying: Go hence from here, beloved Daughter, for You may no longer look upon Me. 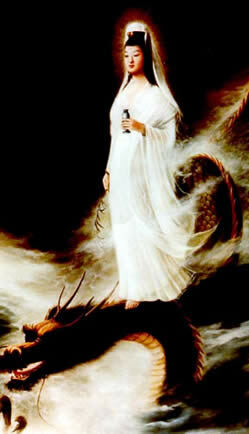 17 And the Children of Heaven led Her forth, and praised Her in strange and gentle songs. 18 And the Maid set Herself apart to pray, and She prayed alone by the running streams and beneath the full moon, until a new light was kindled within Her, which was the pure light of Her own divinity. 19 Yet while the divine light of Her Mother was undying, the light of the Maid trembled before the winds of death. 20 And the daughters of Heaven delighted in Her gentle light, saying: This trembling light is the glory of all the heavens, and more glorious than all the luminaries thereof. 21 And the Maid answered them, saying: I shall carry this light into every place that is, even into the nethermost regions and the regions of death. 22 And they led Her forth and clothed Her in the white robe of the sacrifice. This is a narrative of the Daughter's acceptance of Her sacrifice. It is termed Her "Taking-on of Fate" which may also be interpreted as the assumption of the human state: humans being defined as mortal beings, and fate being precisely mortality (which is why the word "fatal" means "causing death"). It also implies being "bound to the Wheel of Werde" — that is to the world of change and decay as opposed to the Changeless glory of Eternity and of the Mother's Presence. The Taking-on of Fate has been spoken of as akin to the Bodhisattwa's vow not to enter into nirvana until all the world has been saved, "even to the last blade of grass". In fact it is not merely "akin" it is one and the same Event. What is difficult for the modern mind to grasp is that there is only one Bodhisattwa, only one Daughter, only one Saviour. Buddhism, vulgarly regarded as "atheistic" by some Western observers, regards the Divine from the "subjective" perspective. No authentic tradition denies the indwelling Divinity of each being. Christ taught that "the Kingdom of Heaven is within you". Buddhism lays stress on the inward approach, seemingly at the expense of the recognition of external Deity: yet the Bodhisattwa's vow makes it clear that tariki — "other-power": external Divine intervention — is vital to the redemption of the world. 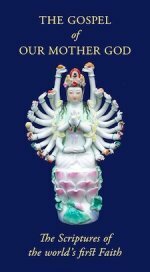 What one must understand is that the Bodhisattwa, whatever incarnate form She may take, is already Divine, but willingly puts off Her divinity for the salvation of beings. Divinity is not multiple, though we may see Her in many lights. The question of whether the Bodhisattwa or Saviour has "risen up" from the human level through Enlightenment or "descended" from the Divine, bringing light, is more apparent than real. To us at the human and individual level, it seems like a real question, but we must remember that the level of Divinity, or Enlightenment is far above the plane of individuality, and that the depiction of these primordial Realities as events in a time-sequence is only a "translation" for our time-bound minds. So whether we speak of Kuan Yin refusing final Enlightenment (which She already possesses in essence) for the sake of beings, or of the Daughter putting off Her Divinity and taking fate upon herself; we are in fact referring to the same Event, the same sacrifice, the same Saviour and the same redemption. Thealogically it may be expressed in the form that since the Mother, who is Pure Being, is life itself, separation from Her is death. How can Dea separate Herself from Herself? How can the Bodhisattwa be Enlightened and yet not be Enlightened, remaining in samsara? The two questions are the same: and the answer, in both cases, is a mystery of Divine Grace. 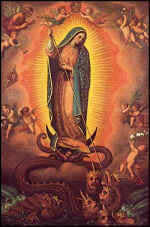 What is fundamental is that the Daughter has overcome the serpent/dragon of death, illusion and the forces of darkness and is able to lead us to the paradise of Her Love. For the sake of a more complete understanding of Aristasian thinking I have again been asked to present a non-Filianic perspective. Non-Filianic Deanists focus more on the serene and joyful Mother, seeing the Daughter-aspect as inherent within Her, yet as wholly joyful rather than sacrificial. To us it is the Mother Who is the Barque of Swift Crossing and who conducts us safely across the sea of samsara. The Feast of Lights [the yearly iteration of the Taking-on of Fate] is to us more a feast of the universal propagation of the Divine Light. As always, we would stress that this is a matter of perspective, or even simply of emphasis, rather than a "thealogical dispute". Most non-Filianic Deanists will happily join in the Filianic celebration of the Feast of Lights, seeing it as simply another way of expressing the same devotion.